A roast dinner wouldn’t be the same without homemade gravy. Now you can enjoy rich, robust gravy– all in a fraction of the time. 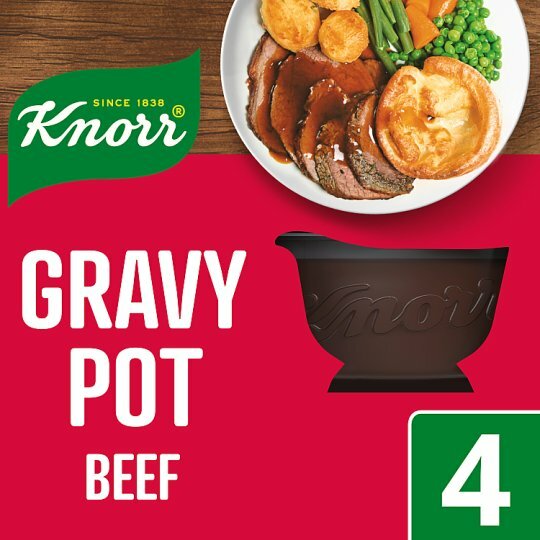 With quality ingredients and slowly simmered meat juices, the authentic flavours of Knorr Gravy Pot Beef 4 x 28g is perfect with all your red meat dishes. Your family is sure to love the flavour of our beef gravy pots. On top of tasting delicious, our beef gravy is quick and easy to prepare. Simply tip a gravy pot into a saucepan of warm water and slowly bring to the boil whilst stirring constantly- ready in minutes! They are also free from artificial colours, artificial preservatives and added MSG, making them an excellent choice for creating a family-favourite meal. Use our gravy pot to create a mouth-watering accompaniment to your main dish. Simply prepare Knorr Gravy Pot and add your favourite meat and vegetables to make a dinner your family is sure to love. You can find great recipes to spruce up your gravy from Knorr with flavours like Red Wine and Onion– simply reduce red wine with chopped onions, add hot water, followed by a Knorr Gravy Pot Beef and simmer until the gravy thickens for a delicious addition to your meal. Discover more quick and delicious dinner ideas at Knorr.co.uk, where there are hundreds of recipes to help you find dinner inspiration. Store cool, dark place., Once opened store in refrigerator and use within 3 days.